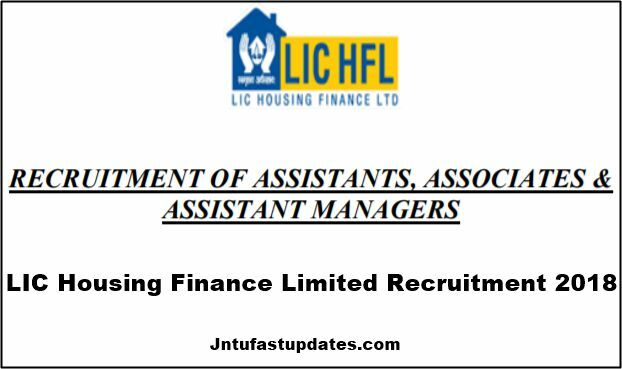 LIC HFL Recruitment 2018: LIC Housing Finance Limited has invited Online Applications from eligible candidates who must be an Indian Citizen for selection and appointment as Assistant/Associate/Assistant Manager. PGDBM/PGPM/PGDM in any discipline from a recognized university/ institute/ board (minimum aggregate 60% marks). The starting basic pay of Rs. 21,270/- per month in the scale of 21270 – 1485(3) – 25725 – 1665(15) – 50700 and other admissible allowances as per rules shall be payable. Total emoluments per month will be approximately Rs. 33,498/- (depends upon the place of posting) plus Lunch Allowance, Provident Fund, Mediclaim, Gratuity, LTC, Group Insurance Scheme, Housing Loan, Performance Linked Incentive and other benefits as per rules. The starting basic pay of Rs. 32,815/- per month in the scale of 32815 – 1685(14) – 56405 – 1755(3) – 61670 and other admissible allowances as per rules shall be payable. Total emoluments per month will be approximately Rs. 52,200/- (depends upon the place of posting) plus Lunch Allowance, Provident Fund, Mediclaim, Gratuity, LTC, Group Insurance Scheme, Housing Loan, Performance Linked Incentive and other benefits as per rules. The above fee is applicable to all candidates and non-refundable. Candidates should pay the requisite fee through the online mode only. Applicants have to bear the transaction charges as applicable for online payment. Payment of Application Fee via ONLINE MODE: Candidates have to pay the Application Fee through ONLINE MODE only. Candidates should fill in the details in the Online Application at the appropriate places very carefully and click on “SUBMIT” button available at the bottom of the Online Application page. Before pressing the “SUBMIT” button, candidates are advised to verify every field filled in the application. A provisional Registration Number and Password will be generated by the system and displayed on the screen. Candidate should note down the Registration Number and Password. An email & SMS indicating the Provisional Registration number and Password will also be sent on the mobile number and email address provided during registration. Candidates satisfying the conditions of eligibility as on 01.01.2018 are required to log in to the LIC HFL’s website and click on “Careers” and go to “Job Opportunities” to open the page “RECRUITMENT OF ASSISTANTS/ ASSOCIATES/ASSISTANT MANAGERS”. Option is available on the page to view the detailed advertisement and also to Apply Online, which will redirect the candidates to the online registration page.